Nope, still no Barcelona posts. I’m such a tease, but I promise they’ll be coming–and sooner than later because… dum dum dum … we are renovating our kitchen! And that means that there will be quite a few weeks of limited access to stoves and ovens and counters so during that time I’ll run some massive posts on food & sights in Barcelona. For now, though, a curried carrot soup and samosas. Carrot soup is one of those things that I always mean to make and never do. When I do whip up a pot, it tends to be a mix of carrots and other things, like this Curried Carrot Parsnip Soup or Roasted Butternut & Carrot Chipotle Soup. Sometimes it’s good to cull out some of the elements, bring the carrot back into its own glory, and this simple, Indian-spiced soup does just that. Between the cumin, coriander, turmeric, and ginger and the creamy element of coconut milk, this is a soup I think I’ll make again and again–if only because it’s so easy to make and so perfect for weekday lunches. As an accompaniment, I made up a batch of these “Lazy Days” samosas instead of the typical side of bread of savory muffin (I swear, corn muffins go with all the soups all the time). While the filling is nothing different than your usual potato-pea samosa, it’s the wrapper that makes it so lazy and delicious. My high school boyfriend’s mother used to make her lamb and beef samosas for special occasions, but with this very non-traditional twist: instead of making a dough and frying the samosas, she would buy biscuit or croissant dough, roll it thin, fill, and bake the samosas. Buttery, flaky goodness with half of the effort. And, thankfully, cheaper store bought brands of fridge crescent roll dough is vegan! Just read the labels to find the right one (Kroger brand in the US is vegan). While you’ll still have the effort of rolling, filling, and crimping the samosas, you at least don’t have to worry about making a dough or frying the pastries, and that’s enough in my book to call them lazy. Plus they keep well and are perfect when reheated in the oven the next day. What’s your favorite samosa to eat? Any fun fillings that I’m missing out on? In a stock pot, warm the coconut oil over medium-high heat. Add the onion and saute 4-6 minutes, until translucent. Add the ginger and garlic and saute 1 minute, until fragrant. Add the spices, stirring to coat everything, and cook 1 minute. Add the carrots and vegetable stock. Raise heat to a boil, then lower to a simmer. Simmer with the lid on until the carrots are tender, 25-40 minutes. In batches, blend the soup in a blender or food processor until smooth. Pour back into the stockpot and stir in the coconut milk. Add the lime juice. Adjust salt to taste. Serve. Wash the potatoes and poke holes in them with a fork. Microwave for 6 minutes, flip over, and microwave another 4-7 minutes until tender. Remove and let cool. Once cool enough to handle, roughly chop the potatoes, mashing them with the knife. Set aside. In a large skillet, warm the coconut oil over medium heat. Add the onion and cook until translucent and tender, 6-7 minutes. Add the ginger, garlic, and jalapeno, cook 1 minute until fragrant. Add the spices (cumin through pepper), stir to coat, and cook 30 seconds. Deglaze with a splash of water. Add the peas and cook until the peas are thawed, adding water as needed. Add the mashed/chopped potato, stir to thoroughly combine. Take off the heat and add the garam masala, stirring it in. Set aside. On a floured surface and working in batches, roll out the crescent roll dough as thin as you can. You don’t want to too thin (at a breaking point), but since it will puff up when you cook, you do want it thin. Cut the dough into large (6-9″) circles (I used a Chimay glass). Spoon 1-2 tsp of samosa filling into the rounds. Dip your fingers into a small bowl of water and trace the outline of the dough, lightly wetting it. Fold two “sides” of the circle in to form a triangle shape and then bring the bottom flap up to close the end. Pinch the dough to close it. Place on a baking sheet and repeat until you’ve made as many as you want. Bake for 10-12 minutes, until golden brown. Makes 30-60 depending on size. I’ve never made straight up carrot soup but it always looks so beautiful. Love the lazy samosas. Perfect for dippage! Carrot soup is the greatest! I like mine with lots of dill, because dill is not just for pickles. But I’ve never made a samosa at home. I’m thinking I need to rectify that one ASAP. Hey, I don’t mind the tease as long as you keep supplying such awesome recipes in the meantime! It’s been far too long since I’ve had samosas, and even longer since I’ve eaten any. These sound utterly delicious, and I love your quick-fix shortcut. Brilliant way to take cut down on the labor. This soup looks terrific! I’ve been looking for Vitamix soups and it looks like I’ve found a good one. I love samosa, but they are a little too ambitious for me. Those samosas are pure genius. I can’t wait to make them! I usually have carrots in my soups but never just carrots – I like how it’s curry flavored. Awesome shortcut for the samosas, I’m certainly lazy enough to try it. The samosa recipe will come very much in handy the next time Mark gets a samosa craving – thanks! And the carrot soup looks lovely; what a great combination. This looks like a winning combination, Jes. 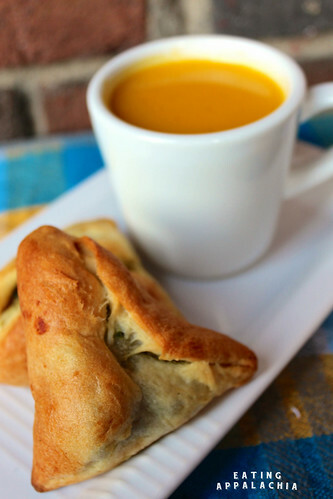 I love curried carrot soup and I love how you made the samosas using refrigerated dough as a shortcut – perfect! Thanks for a classy way to use crescent roll dough. I figured it could be done. Also, I’m so with you on the carrot soup! It is really hard to exercise restraint and just. focus. on carrots. But it’s so totally worth it. Beautiful combo here.